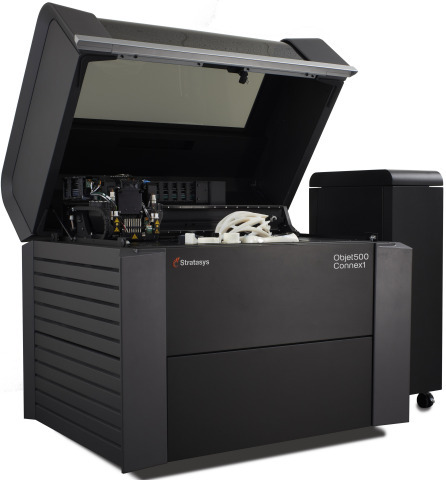 Stratasys Ltd. (Nasdaq:SSYS), a leading global provider of 3D printing and additive manufacturing solutions, today introduced the Objet500 Connex1 and Objet500 Connex2 Multi-material 3D Printers featuring the company’s unique triple-jetting technology. Stratasys triple-jetting technology is designed to allow the user to build products with up to three different materials in a single run, or even mix multiple material droplets to form new digital materials such as tough Digital ABS. Joining the Objet500 Connex3 Color Multi-material 3D Printer announced in January, the Objet500 Connex1 and Objet500 Connex2 offer designers and manufacturers superior versatility for materials, functionality and product realism capabilities. Equipped with a large build envelope, the Objet500 Connex1 Multi-material 3D Printer can produce parts from three diverse materials in a single production run. This allows users to create assemblies with components formed from three different materials, or it can produce components that contain both rigid and flexible materials, such as rubber-like Tango and rigid Vero material. The 3D printer can build a part up to 19.3 in. x 15.4 in. x 7.9 in. (490mm x 390mm x 200mm) or a mixed tray of small parts. A larger material cabinet contains eight cartridges, resulting in more unattended run time and fewer material changeovers than previous models. Hot swapping – or reloading material and support cartridges while the 3D printer is operating – allows for continuous part production. Multi-material 3D printing achieves in a single, automated build what would be either impossible to achieve with conventional single-material 3D printers or would require hand assembly from multiple print jobs. The Objet500 Connex2 Multi-material 3D Printer enables users to combine transparency, durability and flexibility in one part. It has all the capabilities of the Objet500 Connex1 plus the ability to combine droplets from two base materials to produce new materials or “Digital Materials.” Digital ABS, for example, is the most durable material available for the Stratasys PolyJet process and is often used to produce mold cores and cavities for short-run injection molding. With more than 100 material options, Connex2 users can produce a variety of Shore A values in the same part with rigid or clear components, or can combine Digital ABS with pure Tango for strong over-molded handles and grips. The versatility of the Objet500 Connex2 also makes it ideal for creating custom manufacturing tools such as jigs and fixtures. For more information about the Objet500 Connex1 and Objet500 Connex2, contact a reseller or visit Stratasys’ website. Images, video, white papers, a brochure and spec sheets for both 3D printers are available by visiting the Stratasys newsroom. Stratasys and Objet are registered trademarks, and Objet500, Connex, PolyJet, are trademarks of Stratasys Ltd. and/or its subsidiaries or affiliates. The statements in this press release relating to Stratasys’ beliefs regarding the capabilities and benefits consumers will experience from the Objet500 Connex1 and Objet500 Connex2 printers are forward-looking statements reflecting management’s current expectations and beliefs. These forward-looking statements are based on current information that is, by its nature, subject to rapid and even abrupt change. Due to risks and uncertainties associated with Stratasys’ business, actual results could differ materially from those projected or implied by these forward-looking statements. These risks and uncertainties include, but are not limited to: the risk that consumers will not perceive the benefits of the Objet500 Connex1 and Objet500 Connex2 printers to be the same as Stratasys does; the risk the Objet500 Connex1 and Objet500 Connex2 printers will not perform as expected; and other risk factors set forth under the caption “Risk Factors” in Stratasys’ most recent Annual Report on Form 20-F, filed with the Securities and Exchange Commission (SEC) on March 3, 2014. Stratasys is under no obligation (and expressly disclaims any obligation) to update or alter its forward-looking statements, whether as a result of new information, future events or otherwise, except as otherwise required by the rules and regulations of the SEC.